An efficient, multipurpose tractor line designed with just the right size and power to handle a variety of tasks in your operation. 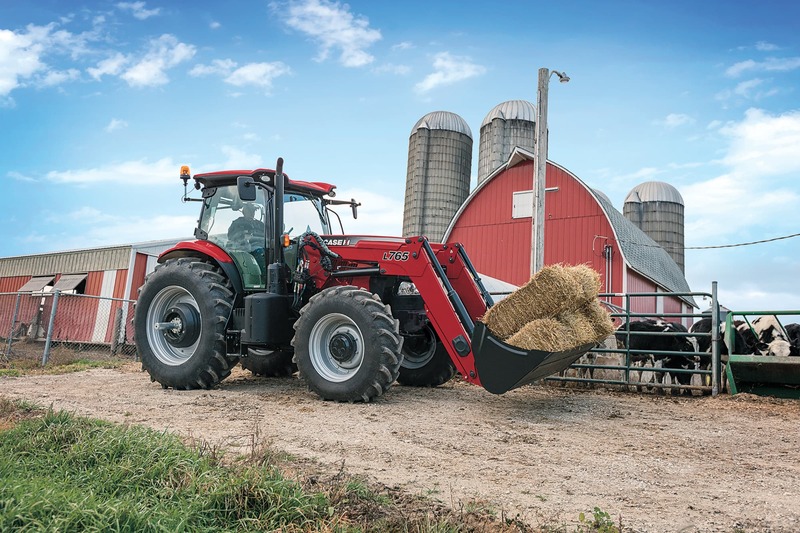 Case IH Puma series tractors® are efficient, multipurpose workhorses designed to handle a variety of tasks on livestock, dairy and mixed crop operations. When you don’t want to compromise power for versatility, choose Puma. Case IH Selective Catalytic Reduction (SCR) technology improves horsepower, engine responsiveness, fuel economy and durability, all while lowering emissions. It's innovation that meets government standards without sacrificing production. SCR maximizes horsepower because the system is separate from the engine. The Case IH Puma lineup has plenty of power in a mid-size package, plus features like Power Boost, Power Growth, and the CVXDrive transmission option - to deliver more power when and where you need it most, while keeping you productive. Select the target speed, and the transmission automatically adjusts to deliver the desired speed and match load conditions. No manual clutching or shifting required. Provides a powered neutral that prevents tractor movement, even with fully loaded trailers on steep slopes. Great for chores that require frequent starting and stopping. Maintains power to the ground. Shifting of gears is done automatically and never under a load, which helps saves fuel and allows operator to focus on other operational needs. The simplicity of our CVXDrive technology makes it ideal for less experienced operators to maintain peak efficiency in all field conditions and applications. Standard 18x6 PowerDrive powershift transmission. 19x6 PowerDrive powershift transmission option available. Operating speeds up to 30 mph. 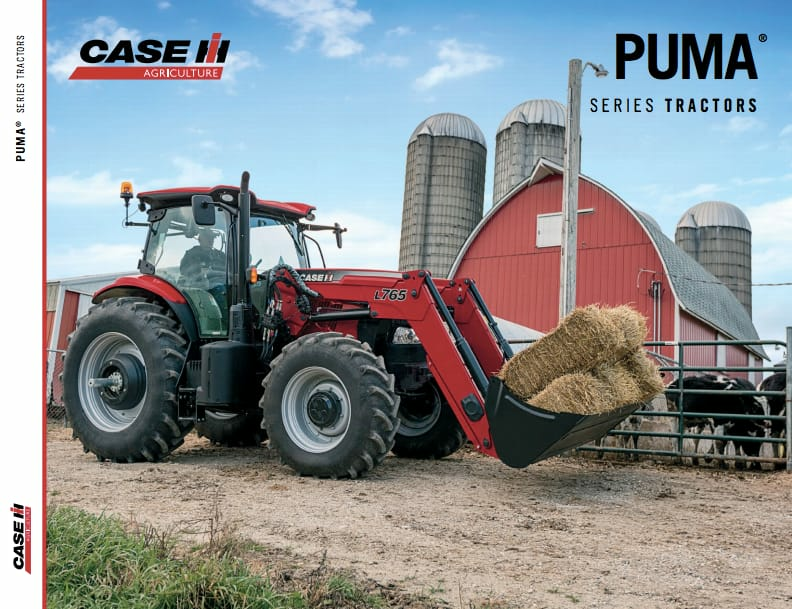 Case IH Puma series tractors have the hitch lift capacity, the hydraulic component features and the hydraulic flow available to handle the application demands. The Puma series tractors offer a high-capacity, closed-center, pressure-flow compensating hydraulic system. The main implement pump is separate from the 17 gpm (65 Lpm) steering and services pump. Factory-installed AFS components and dealer-installed options on Puma tractors offer dependability and convenience and give you the flexibility you need to help ensure you’re ready to begin gathering data as soon as you pull into the field. Minimizing skips and overlaps saves on fuel, seed, fertilizer and chemicals. Precisely placing seeds can improve agronomic performance. Achieving year-to-year repeatable accuracy — as tight as plus or minus 1 inch — becomes reality with AFS AccuGuide™ autoguidance. In a single display, the AFS Pro 700 display provides control functionality and simple integration for Case IH LB4 large square balers and RB5 round balers, Early Riser® planters, Precision Disk™ drills and ISOBUS-compliant implements. Plus, you can use your display with third-party ISOBUS-compliant implements. It's the nature of farming today — producers need to cover more ground in less time. You can't afford to be sidelined for costly service or lengthy maintenance. That's why we engineered Puma tractors with rugged Case IH components proven to provide years of reliable service. And why we added features like the easy-opening hood, convenient service steps to the cab and a right-hand service access door for easy cleanout and serviceability. We also made sure that daily maintenance checks are quick, easy and at eye level. The Puma 150 tractor is available with PowerDrive powershift or CVXDrive transmission. The 6.7-L Tier 4 B/Final compliant engine delivers up to 190 peak horsepower. The Puma 165 travtor offers increased horsepower and power boost when you need it to meet today's challenges. The Puma 185 tractor features a 185-hp engine with an additional 45 hp power boost to get you through tough conditions or steep inclines. Case IH’s Customer Driven Product Design brings industry-leading innovation, efficiency and power to the 200-hp Puma 200. The powerful 220-hp engine coupled with the stability of the longer wheelbase makes the Puma 220 tractor a versatile workhorse for all your farming operations. With a robust 240-hp 6.7-L CVXDrive Tier 4 B/Final compliant engine, the Puma 240 tractor has enough power to get the job done, no matter what the conditions. ​Configure and price your new Puma Series Tractor. Customize it the way you want. ​Compare our Puma tractor specs to other manufacturers' specs.